When surveyed, Oregonians indicated that it is important to have forest protection laws requiring reforestation and protection of environmental values such as water and wildlife. That being said, it is all the more striking that 70% percent of these same respondents said they knew little or nothing about the Oregon Forest Practices Act (OFPA). Oregon became one of the first states to regulate forestry in 1971 when the Legislature passed the Oregon Forest Practices Act. Since then, the state's forest practice rules have been a national model for environmental protection during timber harvest and reforestation. The state is a leader in governing forest operations to ensure the continued growing and harvesting of trees while protecting soil, air and water quality, and fish and wildlife resources. To keep the Forest Practices Act on the cutting-edge, protections have been strengthened over the years as new knowledge became available. And who has always led in the call to create and update Oregon's tough forest practice rules? Oregon's forest professionals in our forest industry have always thrown the first pitch -- by asking for sound standards to keep our forests sustainable for future generations. Reforest within two years of harvest -- All forests must be adequately stocked with healthy tree saplings, or planted native seedlings. Furthermore, forest operators must ensure that young trees are well established and free to grow following reforestation. Oregon has the highest voluntary reforestation compliance rate in the nation -- averaging 97%. 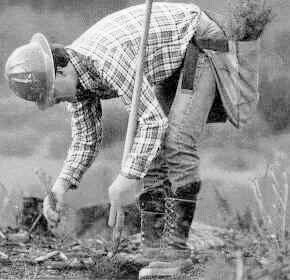 As an example, landowners in Oregon planted trees to reforest a total of 171,571 acres in 1999. Nearly 49 million seedlings were planted -- that's 14 seedlings for every Oregonian. Permits required before harvest -- Prior notification must be approved by state forest officials who review operations for compliance, paying special attention to those areas where the damage potential is greatest. 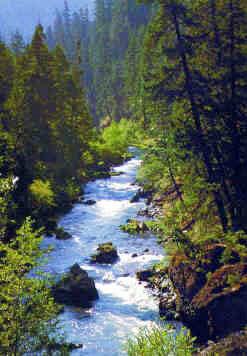 Written harvest plans are required for logging main streams, wetlands, and unstable steep slopes. If such plans are not approved by the state, harvest cannot proceed. To ensure compliance with forest rules, forest protection foresters monitor operations involving tree harvest, reforestation, fertilizer & chemical application, and road building & improvement. Provide comprehensive riparian protection -- New 'Stream Rules' updated in 1995 assure water quality, fish habitat and wetlands are guarded. These stream rules help ensure that Oregon's Salmon Plan will be successful in recovering abundant salmon numbers. Protect habitat and biodiversity -- Retain sensitive wildlife sites, snags and down-wood, while promoting landscape structure and aesthetics. Limit regeneration harvest size to 120 acres. Maintain productivity and minimize road impacts -- Use methods that minimize soil disturbance and promote growth. Apply strict road construction and maintenance standards. Many forest companies have voluntarily committed to assess and upgrade forest roads, improve stream habitat, as well as prioritize leave-tree placement near streams. Such voluntary measures will cost forest owners upwards of $200 million over the next decade. The forest industry committed to a new $14 million harvest tax to support a healthy streams partnership. New agreements between the state and landowners inspire voluntary private projects designed to enhance or restore forest resources, and even reforest long-standing deforested areas--thereby improving future forest productivity. Requested by the forest industry after record rain storms in 1996, the Oregon Legislature passed a moratorium on harvesting and road building where potential landslides could risk public safety. This moratorium allows time for additional research and evaluation by state agencies and a blue-ribbon task force. Studies by Oregon State Univ., OR Dept. of Forestry and others will help determine appropriate updates in landslide hazard mapping, land use planning, emergency warnings, highway closure alerts, and forest operations. A law with big teeth -- The Oregon Forest Practices Act and its rules are backed by very stringent enforcement procedures and penalties. Overall compliance averages over 97% each year.